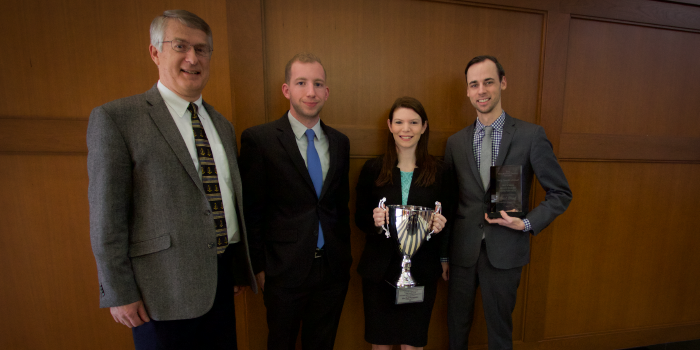 The Wake Forest National Moot Court Team of Matt Cloutier (JD ’17), Mia Falzarano (JD ’17) and Blake Stafford (JD ’17) won the National Moot Court Competition, on Thursday, Feb. 2, 2017, in New York City. Falzarano won the award for Best Oralist in the final round, while Stafford won the award for Second Best Oralist. In addition, the team’s brief earned the Best Brief award. The brief, primarily authored by Stafford, was one key to the team’s success, because the brief counts for 40 percent of the total score in each round of the competition. A total of 185 teams from 120 law schools competed in regional tournaments around the country in November. Then 28 regional finalists competed for the National Championship in New York during the week of Jan. 30, 2017. This year’s problem had a commerce clause issue and a Fourth Amendment issue. Cloutier and Stafford split the arguments on the commerce clause issue, while Falzarano was the “swing person” who argued both sides of the Fourth Amendment issue. In becoming National Champions, the Wake Forest team won all six of its matches in New York. On Monday, Falzarano and Stafford argued against a team from UCLA. Cloutier and Falzarano then argued against a team from South Texas on Tuesday, putting the team in the top sixteen and the elimination rounds. On Wednesday, Cloutier and Falzarano argued against a team from Minnesota, followed by Falzarano and Stafford arguing against a team from Chicago-Kent, as the team reached the final four. Then, in Thursday’s semi-finals, Cloutier and Falzarano faced a team from Tennessee that had the fourth best brief score. Finally, in Thursday’s final round, Falzarano and Stafford topped a team from Ohio State that had the second best brief score. The final round panel included federal judges from the Second Circuit and Eastern District of New York, and state judges from New York’s highest court and its intermediate court of appeals. After the round, the judges had effusive praise for the final round advocates. Back in November, the team won all five of its matches at its regional tournament held in Richmond, Virginia, winning the region and also the best brief award. Professor John Korzen (JD ’91), director of the law school’s Appellate Advocacy Clinic, is the team’s coach.